Bishoprick of Newcastle. Letters Patent. p. Ds. Darcie de Chechie, Ds. Camerarius. HODIE 3a vice lecta est Billa, for the making of white plain Straits, and pinned white Straits, in Devon and Cornewall, que communi omnium Procerum Assensu conclusa est, et missa ad Communes per Magistrum Brooke, Servientem ad Legem, et Solicitatorem Regium. Hodie allata est a Domo Communi una Billa, for the bringing of certain Artificers and Handicraftsmen to Cities and Towns, que prima vice lecta fuit. Eodem die, 3a vice lecta est Billa, That all Patentees of Collectorships of Tenths shall be bound for their Collection, que communi omnium Procerum Assensu conclusa est, et missa in Domum Communem per Magistrum Brooke, et Solicitatorem Regium. Prima, For the Assize of Fuel. Secunda, For the making of white plain Straits, and pinned white Straits, in Devon and Cornewall. 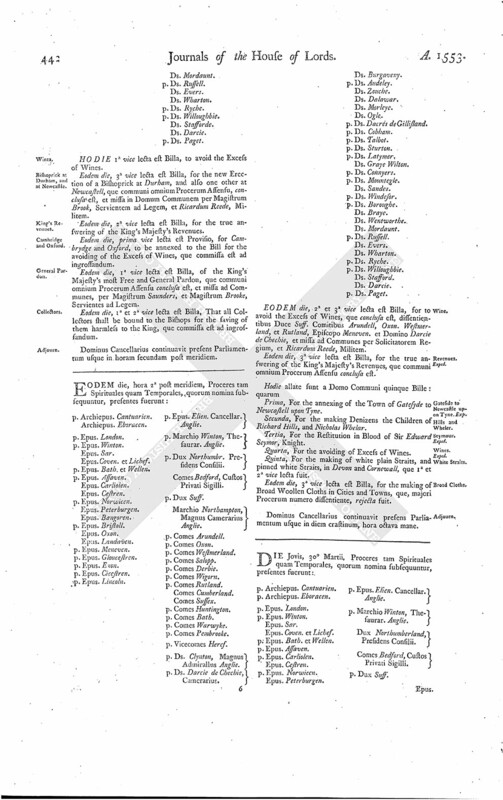 Tertia, For the Alteration or Uniting of Courts, with a Schedule, containing Provisoes added thereunto by the Commons, que 1a et 2a vice lecta fuit. 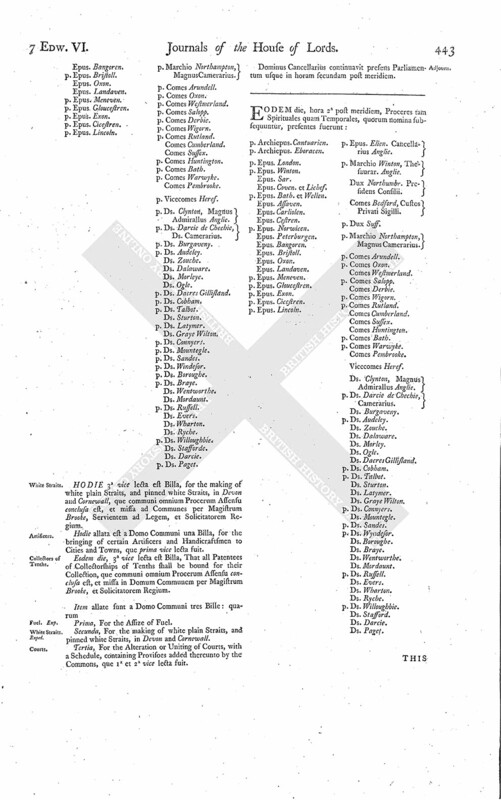 THIS Afternoon, the Schedule annexed by the Commons to the Bill for Alteration or Uniting of Courts, containing two Provisos, being the Third Time read, for that it seemed to the House that the second Proviso might be prejudicial to the King, it was thought good to pass the first Proviso, and to leave out the latter Proviso, which was done; and the same, being new written again, was sent down to the Commons, to the Intent, in case that they should so agree, the Bill might pass in that Sort. Prima, For the Dissolution of the Bishoprick of Durham, and for the new Erecting of the same Bishoprick, and also of one other at Newcastell. 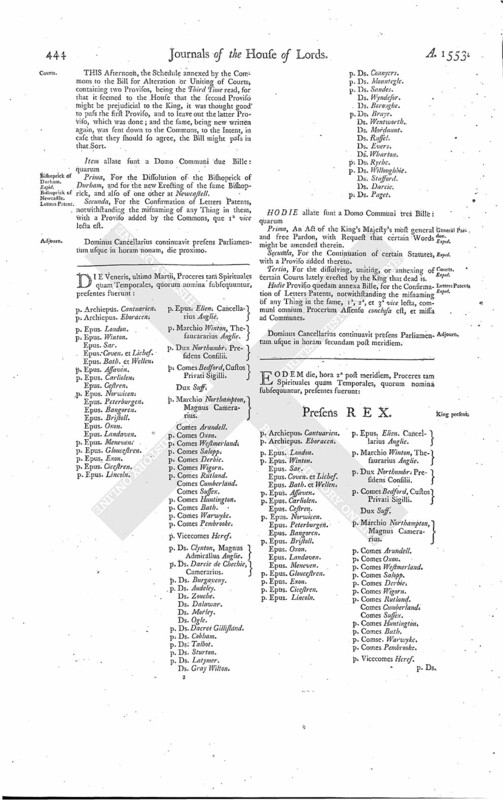 Secunda, For the Confirmation of Letters Patents, notwithstanding the misnaming of any Thing in them, with a Proviso added by the Commons, que 1a vice lecta est. Dominus Cancellarius continuavit presens Parliamentum usque in horam nonam, die proximo.